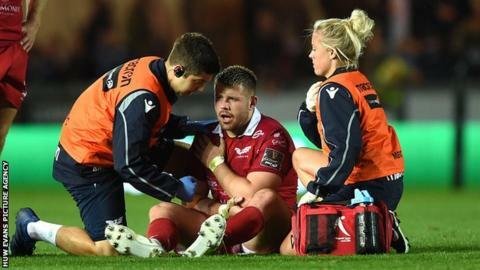 Scarlets have been boosted by the news that Wales prop Rob Evans does not need surgery on a shoulder injury. The loose-head will be out for at least two weeks after being taken off in last weekend's Pro14 win over Leinster. Scarlets coach Wayne Pivac said the 26-year-old felt a strain in training before that match, so had to be replaced after it recurred. "It's good news actually, Rob's a bit sore... no surgeries are required so that's very pleasing," Pivac said. "We'll have to wait another week and we'll have a better idea on timelines. "Rob's probably the best scenario, hopefully we'll have him back in two to three weeks, Johnny (McNicholl) will be training fully today and Jake (Ball) is training today." Flanker James Davies has been passed fit to face Benetton on Saturday after his shoulder scan. Wales outside-half Rhys Patchell is also in contention to play against the Italians, after missing the Leinster victory with a head injury suffered against Ulster. Injury worries have also lifted for prop Wyn Jones, lock Ball and back-three option McNicholl, who could all feature, however number eight Josh Macleod is out. "Wyn Jones trained fully yesterday [Monday] and if he comes through scrums today he'll be back in contention for the weekend," Pivac added. "Dylan (Evans) has had a bit of a bump to his shoulder, because of what we've got coming up we're rehabbing him. With potentially losing two loose-head props to the international window we need to be sensible there." Jones came on as a replacement for Wales against South Africa in Washington DC in June, but then suffered a calf injury in training ahead of the two matches against Argentina. Wales centre Jonathan Davies will again be missing with a hamstring injury suffered in the warm-up at Ulster on 1 September. Pivac hopes the Wales midfield starter will be fit to face Connacht next weekend. "We're not rushing Jon, we want to get him 100% right. There's a lot of big rugby coming up and we're doing okay in that position (centre) at the moment," Pivac said. "The way things have gone for us so far this season we're quite happy with how those results have turned out." McNicholl (neck) and Ball were injured during the 23-21 victory over Pro14 champions Leinster at Parc y Scarlets. Pivac said: "Jake was just starting to feel his Achilles area so the prudent thing was to get him off, he was walking around after the game with ice on it, so it was precautionary." One glaring omission from Saturday's Scarlets side was Wales international wing Steff Evans. Despite starting for the Welsh region against Ulster the previous week, the 24-year-old played for the region's A team in the Celtic Cup against Ospreys. However, Pivac said the decision to relegate Evans was part of the player's recovery plan after a knee injury, and added the Wales wing only faced Ulster because injuries left the coach without any other option. "The plan with Steff was always not to play him in the first couple of rounds [of the Pro14]," said Pivac. "He played last week because of pre-season injuries to McNicholl and [Leigh] Halfpenny. "He has only had three weeks of training since his knee injury and so he's nowhere near his full match fitness and he's not as sharp as he needs to be. "Unfortunately for him we had to bring him back, but once the players were available again he went back to getting himself back to where he needs to be. "He's not been dropped, he's just on track for round four or five."